With a title like The Avengers: The Last White Event, you know it has to lead to something big, or at least the last. 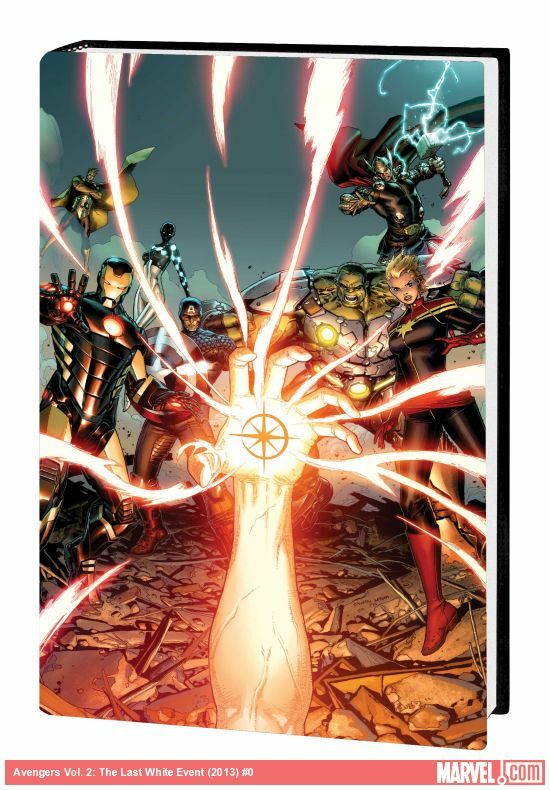 And having read the first 3 parts of Infinity written by Jonathan Hickman who also wrote this volume, well I just knew the path was going to be laid out to the current comic event. So as I read this volume, the question I kept asking was how does this lead to Infinity? A white event occurs when a planet is about to ascend to the next level. The systems put in place by the Builders includes the emergence of a number of a forerunners, including the Nightmask, designed by Ex Nihilo in Avengers: Avengers World. However, the Superflow left by the builders to help govern their systems is being destroyed and their system is failing. Along with the Nightmask only one other forerunner emerges, the Starbrand. When a young man is marked as the Starbrand calamity strikes and the Avengers go into crisis mode. Since the system is broken, this white event is the last white event that will occur. While managing Starbrand, the Avengers also have to face off against Ex Nihilo’s evolution bombs, which are designed to do something new, make the Earth sentient! Two additional shorter stories follow this tale. In the first story, the Avengers are requested to launch a search and rescue mission to recover Canada’s Omega Flight which was investigating the local effects of an evolution bomb. As the team explores Regina, Canada, something unthinkable happens. And finally a group of Avengers attempt to stop A.I.M. from selling a weapon called S7. But the Avengers’ intelligence may not be correct! So I have a problem, this is not the story I was expecting. I know some of what transpires after this story because of Infinity. I thought this story would line up the pieces that we would see in Infinity, but apparently the next volume does that work. So I have a hard time with Starbrand and Ex Nihilo because I know where they are going on their arcs and it is not represented in this volume, mostly because of timing. Maria Hill makes an appearance liaisoning with the Canadian government over Omega Flight. A Canadian official asks Hill why she did not fully reveal the full situation to the Avengers. Her response is loaded, “We lie to them, so they withhold from us. It’s baked into the relationship.” This is a great description of the S.H.I.E.L.D./Avenges dynamic. They need each other. The Avengers keep the world safe by tackling threats that are beyond S.H.I.E.L.D.’s capabilities. S.H.I.E.L.D. provides the Avengers with supplies and intelligence. And of course some Avengers are S.H.I.E.L.D. agents. But in the end this is a love/hate relationship from both sides. This is the tension, and the Agent Hill who I want to see expanded on in the future MCU projects. And honestly, the end of The Avengers does give us the first step towards this tension as everyone disperses. My favorite story in this volume is the A.I.M. story. The story gives us insight into our Avengers, including those who are S.H.I.E.L.D. agents. For example we do find out that Black Widow has no concerns using assassination in order to achieve her goal. And some of the team is a little more squeamish about using murder to fulfill a goal. But the best part is young Avengers Cannonball and Sunspot going undercover and drinking with A.I.M. agents, in beehives and tuxedos of course. Good guys, bad guys, they are all young men who share in a good time and over their excessive number of drinks form some friendships. The most instructive line about A.I.M. comes from Cannonball, “Actually I learned a few of those A.I.M. dudes can seriously drink.” Yes, Sam, yes they can! What did we learn kids? The beehives know how to drink! If you need to liven up your party, call A.I.M.! Honestly, this story volume was not fully what I expected, or needed (there you go Agent Ben). I thought the pieces would have been put in place for Infinity. But honestly there are some chess moves towards that story, but not as many as I anticipated. Of the other arcs one builds on the foundation of the last volume and one could easily be a Secret Avengers story. So for me, Avengers: The Last White Event gets a mixed reaction. But then again, I liked the drinking tale better than I ever did Infinity in the single issue format! So maybe you really should consider giving this a whirl.